Stop your pain dead in its tracks! 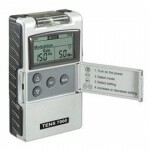 The TENS7000 is a portable pain management digital device that is easy to operate and compact making it a convenient option to stop your pain. The large LCD screen shows the exact parameters being used. Visit us at 18 King Street East, Bolton, where TENS units are available for purchase. Not only do you get a quality TENS unit, but you will also receive professional advice on how to use it! Or you can buy online using PayPal. Shipping to USA and Canada only. $10.00 shipping fees are added to all orders. Please allow 3 – 10 days for processing and delivery.